This totally baller shower enclosure called Plano Acquario by Cesena has a real aquarium built right into one of the walls. How cool would it be to be standing in the shower under a flow of water while watching fish swim around you? Very relaxing. 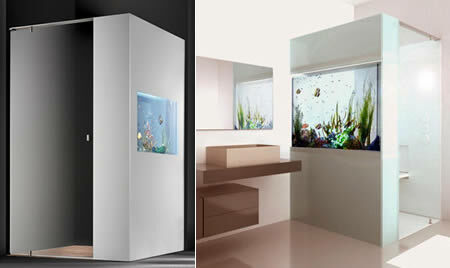 They say you can put a TV or a bookshelf in there instead of the fish tank but what fun would that be? 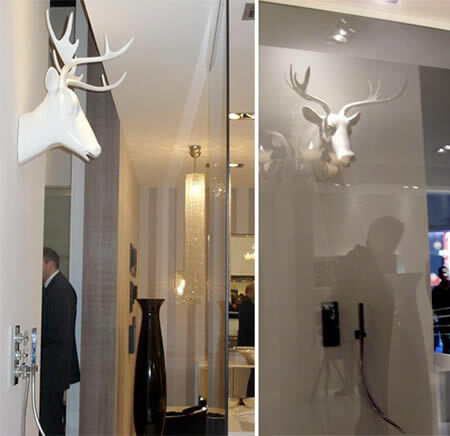 Have you ever wondered what it would be like to take a shower with a deer stag head spewing water onto you? Now you can. This porcelain version was unveiled at Milan Design Week 2010. I've no idea what such a design would even cost, but it's safe to assume it won't be showing up in the fixtures aisle of your local Home Depot anytime soon. 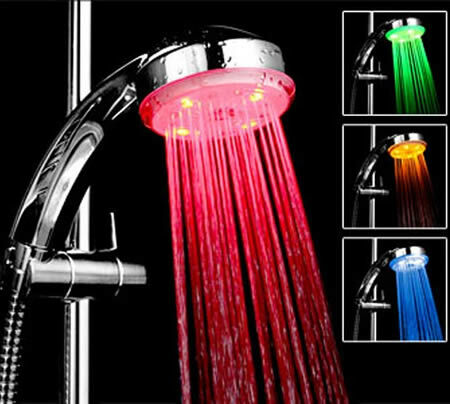 This is shower head with a temperature controlled light so you will never burn your bottom again. Temperature changes from green (when the temperature is less than 32C) to red (at more than 45C). The phasing colours in between are blue, orange, purple and pink. With all of the crazy inventions people come up with today, it comes as no surprise that this baby would be invented. What? You want to be freakishly clean and you enjoy a solid stream of water to caress your nether-regions? Well, look no more! 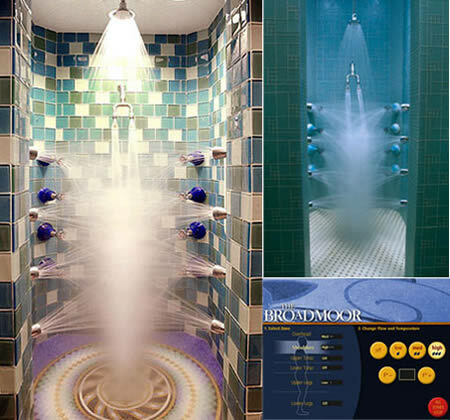 As you can see in the picture, this shower does enjoy the advantage of sporting 18 different shower heads. With adjustable settings (i.e. temperature, water pressure, etc. ), you really can't go wrong with this. Oh wait, yes you can. How? Well, one only needs to look at its price tag. $100,000. Yes, that is 5 zeros you are looking at. I need to find someone who has this and see if they will give me a spin in it. The Viteo Garden Shower begins a gentle, meter high shower as soon as you step on its white platform a little over four inches high. What's interesting about it is that instead of water coming down on top of you; it springs up from below, fountain style. Honored with the iF Product Design Award 2007, the white platform is made from a stainless steel frame base, sturdy UV-resistant ABS plastic white skin and slip-resistant tread. Sandwiched in between are springs which take a light load of about 33 pounds in order to activate the valve which causes water to spray from an inner channel system to 16 fine cone shaped jets. The result is a gentle cone of water from 2 to 4 meters (6ft to 13ft). And while the gushing flow of cold water from your tap may prove rather startling, not nearly as so as the cool $930US price tag. This Folding Shower, is a concept by French company Supiot and it is currently looking for a manufacturer and a distributor. 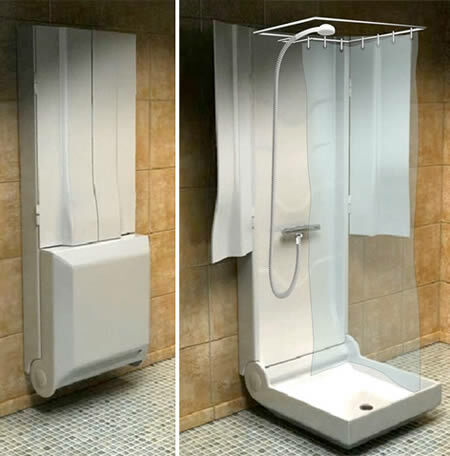 It has a unique design that's supposed to allow people living in small apartments to install a shower that doesn't take up too much of their limited space. The industrial designer Ron Arad came up with this rotating shower/bath with Italian manufacturers Teuco (the shower section of their website was particularly funny). You can have a bath in the lip, or rotate it around to give you a shower cabinet if you fancy that instead. Of course, you'll need a bathroom the size of most of our entire flats to fit it in. And it also doesn't explain why this girl is having both a shower and a bath with her clothes on. Still, it's very cool. 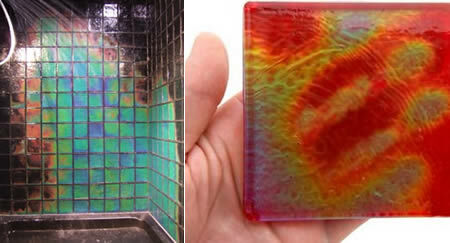 These awesome temperature-sensitive glass tiles will change color depending on their current temperature. You just tell the manufacturer what base temperature you want, and every 6-10 degree increment from there activates a different color phase. There are three phases in all, and once you've passed the third, it will return to the original color. I wouldn't recommend installing these in a house with more than one or two people in it. You can bet that the first person in the shower is going to use up all the hot water just messing with the colors on the tiles. Of course you'll need to rob a bank first, since a single 4” x 4” tile will run you $33, or around $300 per square foot. It's nice being clean. It's a shame, then, that being clean is just so much damn work. Like, you get in the shower, and then you're supposed to STAND there. Stand! And you have to be rubbing soap on your body and shampoo in your hair, and if you try and do that in opposite directions at the same time, it'll make you fall over and you'll crack your head open and die. And that would be bad. The automatic human washing machine takes most of the dying out of showers by not only giving you the chance to lie down while getting clean, but also by doing all of the actual cleaning for you. 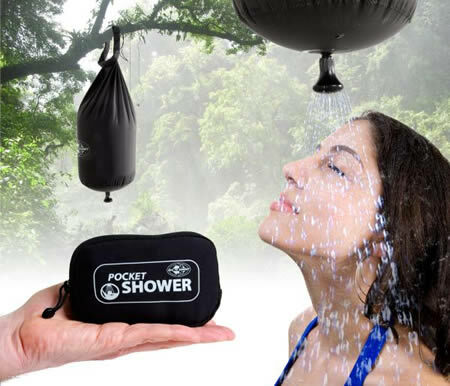 You stick yourself inside the washing pod and command it to go, and it will wash you with soap and water, use infrared light to steam heat you, pamper you with sound and aromatherapy, and then finish up with a seaweed wrap and some body lotion. Then you get out, and the machine sterilizes itself to get rid of all the nastiness you left behind. 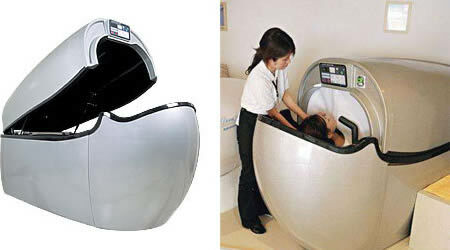 I have no idea how, or how well, the automatic human washing machine (aka the “Santelubain 999?) actually performs its numerous cleaning tasks, but the website assures us that “the automatic human washing machine has been recognized by various people through coverage by different medias.” Ah, okay, very good then.